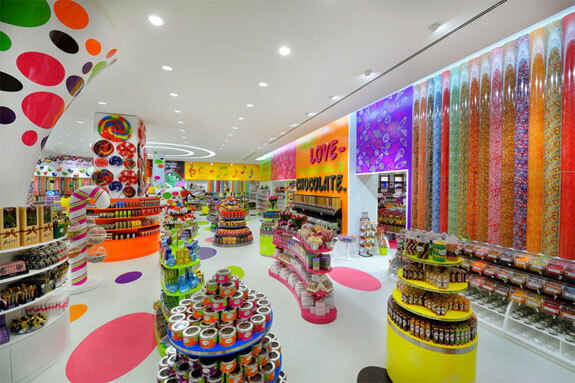 This shop in the mammoth Dubai Mall is probably as close as you can come to a real-life Willy Wonka candy experience without wrangling some umpa lumpas and creating one yourself. 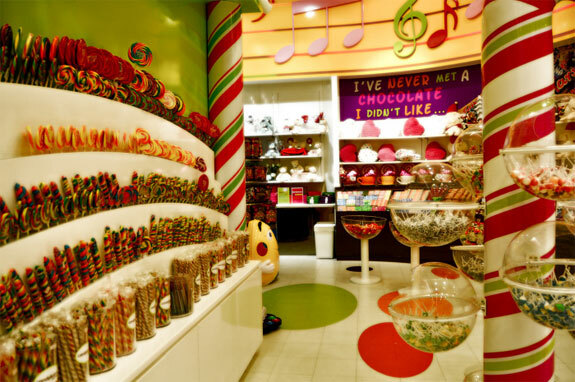 The Candylicious flagship is 1,000 square meters (10,000 sq ft.) making it the largest candy store in the world. Before you even get to the store you’ll likely see the Candylicous Car circling about. Highlights inside the store itself: a lollipop tree, a Candylicious Airplane kids can ride and an old-timey soda fountain. This chain of self-described “caramel artisans” have stores in Barcelona, Amsterdam, New York, Seoul and Taipei, but it is their Tokyo location that we pick as our favorite. 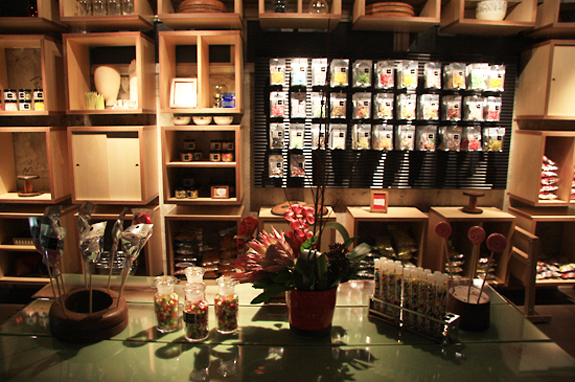 At all Papabubbles you can watch candy being made in the store and dig into free samples. 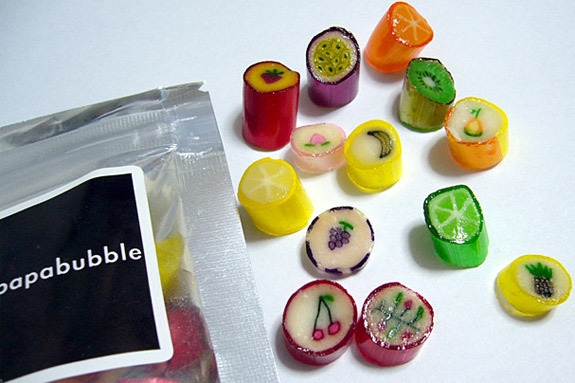 (NB: walk into a Papabubble during a candy making session promising to “just look” you’ll likely be walking out with a purchase). The Tokyo Papbubble is especially great because of the wacky Japanese candy designs, including candy sushi and giant caramel toothbrushes. Chutter’s claim to fame is the world’s longest candy counter. It’s 112 feet (34m) long, which is the entire length of the store. 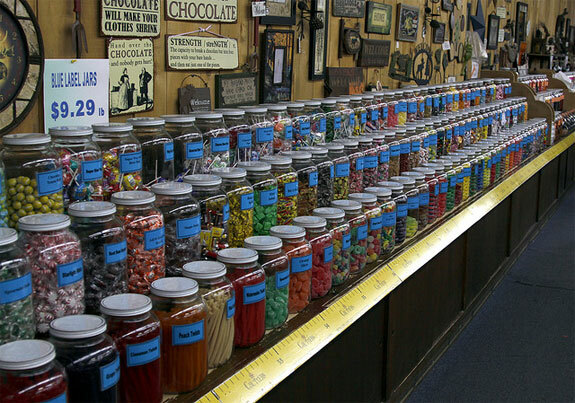 Jars of gum, sugar fruit slices and candy knickknacks are stacked three deep the entire length of the counter. So . . . let’s see . . . each jar is about 5 inches wide . . . multiply by 112 feet long . . . multiply by 3 jars jars wide and you get . . . a whole heck of a lot of candy. There are surely many other corner shops like this in the world—or we like to think so—but we decided to select Het Oud-Hollandsch Snoepwinkeltje as the epitome of the wholesome local candy store. 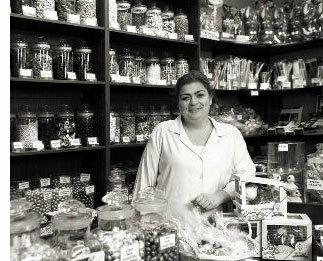 Located in a working class area of Amsterdam, this is the sort of place where kids save up coins, spread them out on the counter and gleefully select treats out of apothecary jars. The ubiquitous owner, Mariska, seem to know every regular by name. The video below gets across the spirit of this place even to those who don’t understand Dutch. 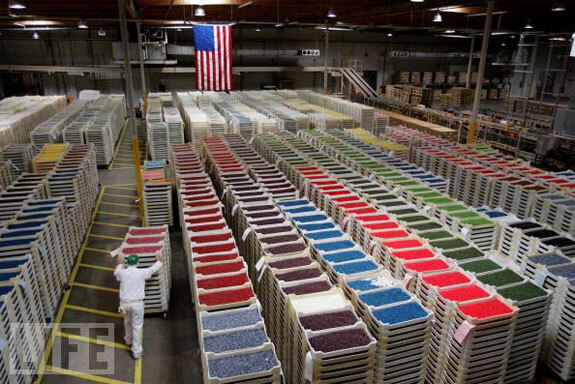 The otherwise powerfully unexciting San Francisco Bay Area town of Fairfield has what is among the world’s best interactive candy experiences: Jelly Bean University. Go Fighting Licorice! “Students” don lab coats, learn about jelly bean making and take a try at creating concoctions. Those who survive the rigors of it graduate with a Degree of Beanology, which will surely increase your job prospects. “Classes” are restricted to six students; reservations required. 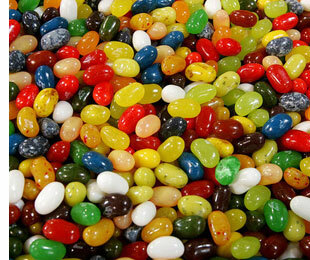 The Jelly Bean Factory also offers free 40-minute tours, an enormous candy store and a cafe where you can order, among other items, a jelly bean shaped pizza. Depending on your point of view, it’s either Hello Kitty heaven or hell. (Who are we kidding? It’s hell.) 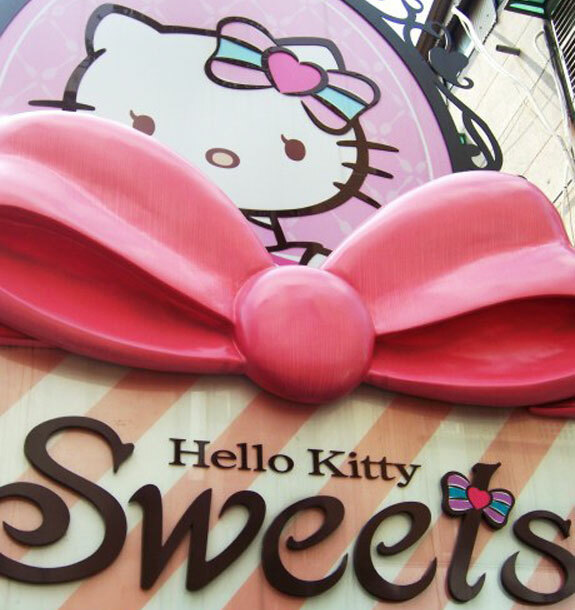 Hello Kitty Sweets offers a culinary experience inspired by Japan’s famous cartoon cat. At the walk-in counter a selection of candies and chocolates are for sale. Beyond that there’s a dinning area where the store’s customers—comprised primarily of single middle-aged women and surprisingly unpopulated by any children—can feast on Hello Kitty cakes, pastries and even a few entrees. None of it is particularly tasty. But then what do you expect from an eatery inspired by a cat with no mouth? In case that’s not enough of a cute overload for you, stay in one of the shop’s Hello Kitty-themed hotel rooms. Picture a room full of Hello Kitty products surrounded by pink. Lots and lots of pink. When you go: Hello Kitty Sweets can be a bit hard to find. It’s on Da An Road near the intersection with Zhong Xiao, around the corner from Bistro 98. If you are looking for Hello Kitty merchandise head to the nearby Sogo department store. 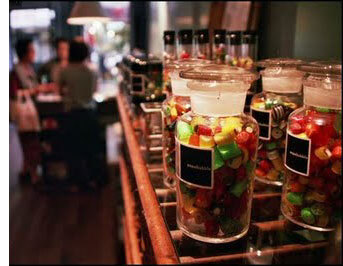 You have to check out this Candy Store in Canada! It’a huge – Candy from all over the world, the staff sing and laugh. It’s in this small town along Hwy 2 in Alberta. I think the town is Nanton. The theme of the town is old and antiques. The Candy Store is huge and has an antique store in the back and an Ice Cream store beside it. Check it out. Thanks, Trudy! Will make sure we check it out and test some of their product — you know, for research purposes — next we’re in Alberta. Great article! I wish there was something closer to Florida. There’s an M&M World Store here at our Florida Mall in Orlando – it was pretty cool but overpriced, in my opinion. Excellent! Thanks for the tip, Michele. Wow – nice article and photos. Of course it made me wanna eat a candy or at least a cookie. The shop in Dubai is by far one of the best 🙂 i feel like a kid all over again. Very exciting to see these pictures!!!! 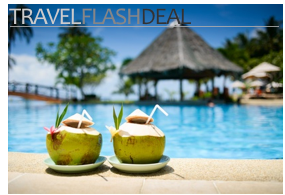 !kutties will love to come here…. I am very jealous – not one of these sweet places is any where near me! 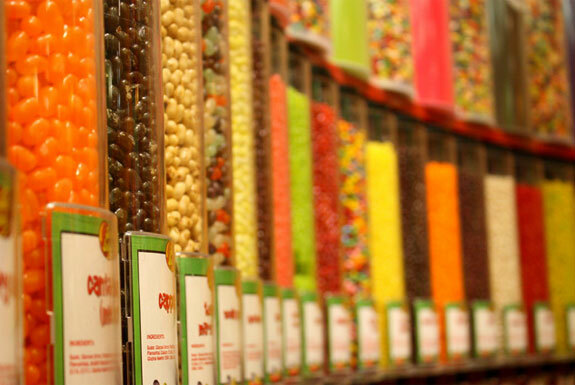 I can’t believe the world’s longest candy counter is only 4 hours from my house…ROAD TRIP! I’ll have to check it out for my blog of world’s largest things. 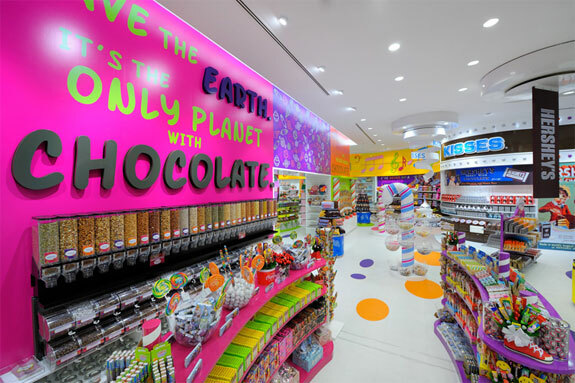 The M&M World store in Times Square is pretty amazing, even though it’s focused on just one candy. They have the world’s largest wall of chocolate, I’ve heard!